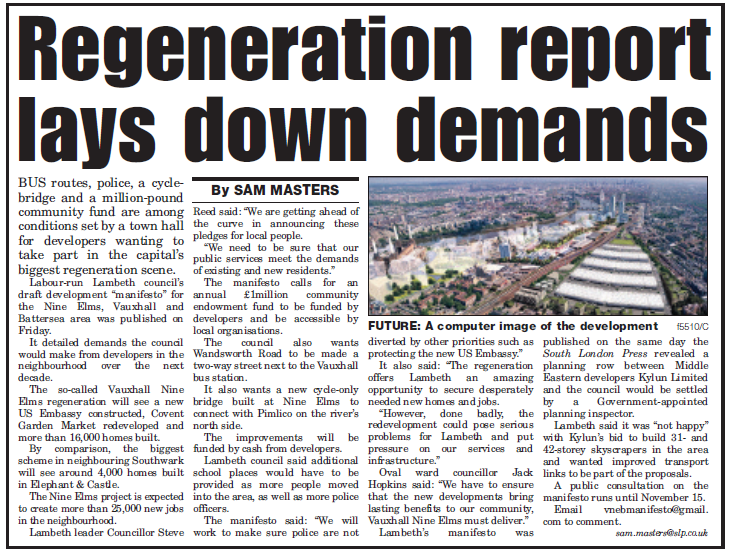 Lambeth’s Labour Councillors have unveiled their plans to transform the Vauxhall-Nine Elms-Battersea area to ensure local residents get the maximum benefit from the regeneration proposals. One of the highlights is the plan to develop a new ‘Community Endowment Fund’ of at least £1million which will provide an annual pot of money for local groups to ensure that the benefits of the regeneration continue after the building has finished. In addition, funding that comes from new developments for improving the community will be ring fenced so it can’t be used to subsidise any overspend on the planned Northern Line Extension. The draft manifesto will go out for consultation over the next two months. Labour Councillors will be discussing the plans with local people, community groups, residents’ associations, and other key stakeholders. · New bus services along Wandsworth Road and Nine Elms Lane. · A cycle bridge at Pimlico, new boat services, walkways and improved access to the river. · Traffic calming measures and improvements to prevent ‘rat runs’ through residential areas. · Preserve and improve Vauxhall Park, Spring Gardens and Larkhall Park. · Lobby TfL to remove the Vauxhall gyratory to improve the area for pedestrians and cyclists. · Ensure that any new tall buildings do not significantly overshadow parks and homes. · Create extra school places, doctors, and ensure hospital services are not adversely affected. · Ensure police are not diverted by protecting the new US Embassy. 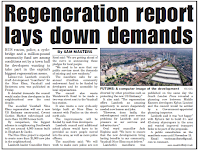 · Ensure developers offer apprenticeships for young residents and the unemployed. · Work to provide new spaces for retail outlets and street markets. The consultation on the draft manifesto will run until 15 November. To download the manifesto, click here.